This past weekend we’ve been building our hous kuk (an open air kitchen) preparation for learning how to prepare meals in a village (i.e., how many ways can you prepare kaukau or sweet potato over a fire and without refrigeration?). On Thursday, the Papua New Guinean workmen demonstrated in two hours how to build a full house and table. Jess and I soon realized that our own construction would not be quite that easy. First, we needed to plant the two main roof supports into the ground; since our only man-made tools in building this hous kuk consisted of the tarp roof, a bush knife, an axe, and some string, we attempted to follow in the workmen’s footsteps by slamming the posts into the ground, wiggling them around, then slamming some more, until they reached a suitable depth (8-12 inches, so the rains don’t wash it away). After a good many minutes and blisters later and only about 4 inches down (later, we found out our ground was unusually hard and made of clay…), we began to see the value of community building projects :) One of the workmen in particular took pity on us, and after lifting out our hard work with a twist of one hand, helped us create a suitable foundation. Many of the pieces of wood were not the right length, and so, Jess and I fell to the task of hacking them down to size. Using the bush knife looked easy—everything seemed to split in one or two strokes, and after all, there was a massive blade, so how could we miss? Ha. We soon named our house The Beavers. Wood chips were scattered everywhere as we pecked away at our logs with the various cutting implements, rarely hitting in the same place twice, and barely making a dent in the hard wood despite our attempt to mimic the smooth swinging action of the workmen. But, where technique lacks, perseverance (or desperation?) can prevail, and Jess and I took turns until we had a stack of logs with gnawed off edges in the general vicinity of the same length. And now, we simply have a large pile of fire-starting woodchips! Next we set to tying and wrapping logs together with our bundles of red and green string, often in knots more creative than even a seaman could think of. But hey—stuff is still holding! Several of our very enthusiastic helpers! On Saturday, a group of four or five boys, between the ages of eight and ten, came over and watched us struggle to shove our table legs into the hard-packed ground. “Yupela nogat man?” they inquired with curiosity, asking about our evident lack of husbands. Before we knew it, they had deftly smashed our table securely into the ground, began hacking apart logs to build the top (wielding their bush knives with superb accuracy), wrapped yards of string to hold everything together, and then set to building us a counter so that we could wash our fruit and dishes. They chattered away in Tok Pisin, and we attempted to communicate back (and direct the boundless energy of eight-year-olds such that they didn’t chop up everything). Now Jess and I are adding the finishing touches to our hous kuk. We’ve decided to install a second countertop and reinforce the sink. Decorations are next on the list, and seeing as our bush-knife chopping technique is improving, we might even get a bit fancier. Extreme Home Makeover, here we come! PNG happens to be an island nation (over 600 islands total, I believe). Islands are surrounded by water. Boats are used to travel over water. People riding in said boats end up in water. So, part of the course here in Madang is learning how to swim in the ocean. Every Wednesday we hike or drive down Nobnob mountain to Nagada bay, a calm inlet of the Pacific Ocean. Our fearless leaders put out three ropes parallel to shore: a 100 meter length for the advanced swimmers and two shorter ones for the children and the beginners. We then, gasping and struggling, proceed to swim laps clockwise around the bobbing, floating ropes. The ultimate goal? 8 laps or 1600 meters, which equals one mile. After we’ve been prepped with a lecture on all the potential threats found in this water that can sting, spear, poke, gouge, and generally maim you and admonished about seventy more times with drink more water! wear your water shoes! we finally wander toward the shoreline, which in itself is a novelty. There is no sand here—rather, the shore is comprised of bits of white coral and shells. Finally, I begin wading out in the warm water toward the rope. This looks like a good spot. I duck under for the first time… and come up sputtering and shaking. It’s salty!! I stare at the water in amazement. Salty? It’s actually true?? I tentatively stretch out on my stomach, ready to start a front crawl… and a wave comes rippling forward, over my head, slaps my face, spoons salt down my throat like a nasty cough remedy. AHHHHH! It’s still salty! And it’s alive—I swear, that wave went for me! How dare it! Slowly the realization dawned on me. This was no benign Mud Lake or Long Lake or Round Lake or any of those other bodies of water that are so numerous we have to resort to the most uncreative names. This was an ocean. The Pacific Ocean. And that fact means learning new things. For example, the salt absorbs through our skin, and so we become even thirstier than normal. The equator sun burns our skin faster, so most of us swim with t-shirts and perhaps hats. In order to be culturally appropriate, women wear long baggy shorts or even skirts (have you ever tried a froggy kick in a skirt?). When swimming one direction, those 100 meters takes what seems like 1500 strokes, while the other way I can glide along in only half that many. But I adapt, realizing out of desperation that if I time my rising and falling with the waves, I receive a great many less salt water drinks than if I don’t, and, very importantly, swimming crookedly will help me prevent collisions with fellow struggling swimmers. Crash! “I’m so sorry! <sputter, sputter, spit> I thought I was over there!” we call out to each other, before the waves duck ourselves apart a few meters away. The coconut doesn’t answer, bobbing its way toward shore. Yep, this is definitely the ocean. On Saturday we drove into Madang, the closest large town to POC, to do some shopping. The adventure starts with the truck ride on the Hino, a truck that has benches on its bed to hold twenty or more people. The road down the mountain winds back and forth, etching the mountainside as it curves around towering coconut trees and massive ferns reminiscent of some prehistoric era. The ever-present rains carve miniature Grand Canyons into the rock and sand, creating craters that I think could potentially be visible from outer space. But, the faithful Hino and our talented drivers navigate the obstacle course with speed and precision. Out one window, the ground drops off, and I can see the Pacific Ocean, glinting until it merges with the sky; through the other window, ferns reach their freshly-washed hands inside, dripping down my neck in a friendly greeting. We shout conversations across the benches, swaying and jerking like water in a pail, and brace against the poles, warned by the downshifting of the truck for the upcoming pothole. Saturday morning is market day, and the whole town thrives with activity. Men, women, and children wander the maze of stalls in the outdoor market, where selling bilums (string bags), laplaps (skirts), meri blouses (women’s shirts) is more than just a business—it’s the week’s social event. Two other girls and I snack on roasted peanuts as we look at the wares, feeling cloth and nodding moning at the venders, many resting on the ground in the shade of thatched shelters or the huge tree that spreads over the market. Tarps stretch across the ground, advertising a plethora of food at only a few toea—taro, pineapple, mangos, greens, carrots, guava, peanuts, and avocados bigger than my fist. We keep our skirts tucked close, careful not to let them brush over any nearby greens. After we left the market, we begin wandering through other stores—Papindos, Best Buy (it’s not the electronic store you’re thinking of, but instead carries a bit of everything—almost like a Pamida) and a local pharmacy, looking for basic toiletries. Shopping is a hunt, and goods don’t necessarily show up in the same place twice. I stare at plastic containers and attempt to translate kina into dollars. The PNG flag and colors are everywhere, proclaiming evidence of their national pride, and signs shift between English and Tok Pisin. Hours pass quickly, and soon, we are all gathering back at the Hino, chatting about our purchases and experiences. Bags are tucked under our feet, and we hang fruit in bilums from the Hino’s rafters as it jerks and sputters to life. Everyone stops and stares as we trundle back to the main road. One of the children sticks his head out the window and waves. “Apinun!” A chorus of greetings and smiles echoes back as we pick up speed. It’s time to go back up the mountain. Jess and I just celebrated Christmas yesterday evening. Christmas and birthday and summer holiday all wrapped into one, in fact. What happened? The Bag arrived, and with it, the miracle of clean underwear. So, there we were, ready to jump into this grand adventure of orienting to a new culture… with only the clothes on our backs and our computers in our hands. Items that wouldn’t be an issue in the US suddenly become very important. Such as a flashlight (since the power can go out at any time)… which happens to be in The Bag. Or a water bottle to help prevent dehydration, or water shoes, since any cuts from coral will get infected very easily, or elastic hair bands (you try living in the tropics with long hair!) or sunscreen or bug repellant or… You get the picture. All of this was in The Bag. The shopping trip on Tuesday into Madang (the nearest town) was able to relieve some discomfort (because of the heat and humidity, clothes aren’t worn multiple days in a row), but it’s one thing to be shopping as a casual tourist, and another to have a long list in one hand, kina in the other, and a watch declaring that you must be back at the truck before two hours have passed. So, when the truck pulled into the dorm’s courtyard today, we bolted out of the dining room, hoping that the rumors of an arriving bag would actually be true (we didn’t know whether it was Jess’ or mine, but at this point, we didn’t care; this is when having been roommates twice before significantly helps matters…). It was true! Hallelujah! Rejoicing abounded, and Jess and I danced around as giddy children as Jim deposited The Bag on our floor. “Is that all you brought?” one woman asked. All? All!? This 44 lb bag is like an entire department store! It didn’t really matter that within 15 minutes everything was shaken out, folded, and stowed. We had skirts! We had sunscreen! We had underwear! What else does one need? Yes, that is what it looks like. Everywhere. I am settling into life here at POC (the Pacific Orientation Course) in Madang, PNG. We are situated at the top of Nobnob mountain, overlooking Madang and the Pacific Ocean. There are about twenty-two students and another thirteen expat staff members (as well as quite a few children), hailing from as far as Finland, Brasil, Australia, Germany, US, Canada, Scotland, and Romania. The purpose of the course is to teach us the skills we need to interact comfortably in the Melanesian culture here in PNG, Vanuatu, and the Solomon Islands. This includes studying Tok Pisin (a widespread language of PNG), learning basic village living skills (such as dehydrating food, building a hous kuk, treating malaria etc. ), acclimating physically (through conditioning training such as hikes and swims), and discovering Melanesian anthropology. The students are from a variety of organizations and will be proceeding to a variety of jobs after POC has finished; translators, like myself, are actually in the minority compared to the support staff positions. What’s it like to be here? I hope to show you over the next weeks as best I can through stories, pictures and, if I get savvy enough, perhaps even a video. At the moment though, it simply feels rather surreal. The landscape is like nothing I’ve ever experienced—mountains upon mountains of tropical rainforest, flowers blooming everywhere, a guava tree growing right outside my door, birds with songs I’ve never heard before (and then familiar ones…like the mountain roosters that start crowing at 3 am and sound like a pack of coyotes). Roofs are thatched with palm leaves and solar panels provide electricity. I sleep under a mosquito net and take showers with a bucket (which is far more water than you think). This is the view from the office veranda--crazy! Am I really here? I wonder. Could I actually be dreaming? No, this is not Catherine. It’s her sister, Hannah. Otherwise known as the cook. Catherine is in Papua New Guinea this very minute, with, hopefully, the hardest decision she’s had to make over the past few days being whether or not she wants to risk ingesting the airplane peanuts which probably had an expiration date of about a hundred years ago. Mercifully, she didn’t have to suffer such culinary injustice during her last week at home, thanks to her sister. 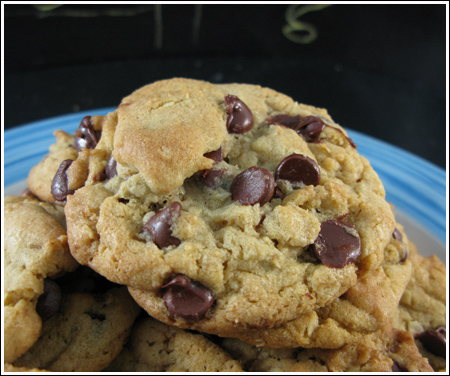 Chocolate chip pudding mix cookies... mmmm. Saturday was nothing of much importance except I helped make a huge breakfast and we all ate some amazing pudding mix chocolate chip cookies that I made the day before. Catherine crashed and tried to salvage what brain cells she had left after finals. I made some gourmet grilled sandwiches for lunch to help that, got Catherine’s and Dad’s mixed up, but Catherine was nice about it anyway, because she always is. On Sunday was her commissioning service, which went wonderfully! She was so blessed by all of you who came and understands that many of you wanted to come, even if you couldn’t make it. Of course, the advantage for me was that I didn’t have to cook, because if you came, you know that we fed you. ;) I promised to stuff some food down Catherine because I knew she wouldn’t eat with her friends there but I’m afraid she still didn’t get much to eat. Oops. At least that meant she was talking with all of you and saying good-bye. I love lasagna! The colors are so beautiful. She kept on unpacking (from SIL) and getting ready to start repacking (for PNG) on Monday. We really didn’t see each other much, though, because she was locked in her room and I was locked in the kitchen, as that day for dinner it was lasagna and roasted peppers and corn on the cob and chocolate chip pie (though not at the same time). I wandered around the kitchen and tested the chocolate chips for poisonous ones and Catherine wandered around the house and tested the packing lists for faulty ones. Tuesday I ignored all cooking and Catherine ignored all packing and our family went on a positively marvelous vacation in Duluth where we ate lots of food that I didn’t cook. On Wednesday, her request was homemade bread, so I looked through a whole bunch of recipes which we didn’t have ingredients for and finally chose one that we didn’t have the ingredients for and made it minus all the ingredients we didn’t have and changed out ones we did have anyway. Catherine and I ate a lot of that bread in a sister bonding activity. That nice calm atmosphere got a little shattered on Thursday: With 24 hours to her departure, we found out that weight limits on baggage on the last connecting flight to PNG were significantly lower than expected, and this began the semi-panicked repacking. It was panicked because suddenly much of what she wanted to bring she couldn’t, but only semi because, well, Catherine doesn’t panic. And I just kept on cooking. 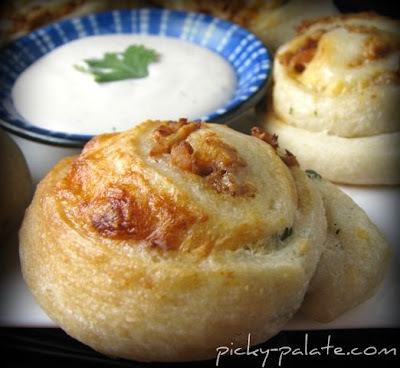 Yeah, my pizza roll ups didn't look this good. So while Catherine and Mom and Dad threw themselves desperately into intense packing and repacking and measuring and weighing with Dad’s whiz bang space age scale, I threw myself into intense chopping and rolling and baking and measuring. They took lanyards off flash drives and were relieved that that actually reduced the weight; I chopped peppers and was relieved that my cut finger didn’t bleed more than it did. They searched the house to find containers that weighed ounces less than other containers and made due without them anyway; I searched the kitchen to find ingredients we didn’t have and made due without them anyway. They contemplated making Catherine wear all her clothes on the flights so that she would look like a little walking pumpkin; I contemplated how these annoying little pizza roll ups could end up looking like a little nuclear explosion. The intrepid packers made progress, however. This was in part through discarding from Catherine’s bag nearly all of her things to do on the plane (I suggested she keep busy by flipping a coin 1000 times to see if it really came out even 500 heads and 500 tails) and we were all tired and then we ate pie. Pie that I dished up. 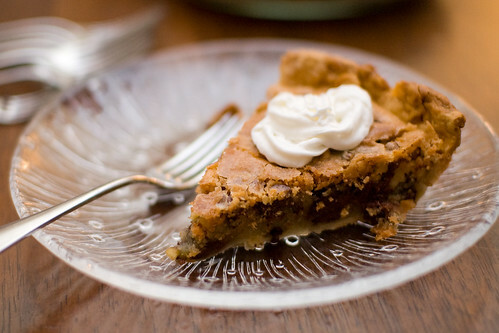 Chocolate chip pie: nearly as amazing as peanut butter and twirly skirts combined. Finally, Friday morning I made a Last Breakfast complete with 6-fruit smoothies (about which Catherine commented, “So, this sure has a lot of flavors in it,” ever the polite sister) and fluffy French toast (which is profoundly different from moldy French toast). They kept packing and weighing and after a short break I found myself dragged into the kitchen again by some mysterious attractive force and started making soup and sandwiches for the Last Lunch. They were positive Energizer Bunnies (my wonderful food did it, for sure…) after eating she went right back into that living room and kept on weighing (did you know deodorant weighs six ounces? Unreasonably heavy.). Because send-off toasts are always better when done with chocolate malts. I looked down at my evaluation. Very good, the words scrambled across the page, but be sure to include the English glosses after each word when you record your lists. Why? I thought to myself. I have the English words in a corresponding list in my data notebook—why take the time to record the English along with the Marathi words as well? Throughout the summer, the theme only continued. We use notebooks that are sewn rather than stapled (staples rust and stain), writing with pens that use indelible ink (so that it won’t smear if it falls out of the canoe and into the river). Our notes stay on the right side of the page, spaced four lines apart (so everything remains entirely legible) and cited against all other available data such that it eventually resembles the Encyclopedia Britannica. Data is backed up on a regular schedule and cross–checked and cross-stored until the most paranoid bank manager or CIA official would be satisfied. Organized. Neat. Well-documented. Archived. These are not themes that are found in every Introduction to Chemistry or Non-Western Contemporary Literature classroom, and yet here grades rise and fall depending on the method of labeling audio recordings. You have an obligation to share, to publish, they say, to be diligent in preservation. The finely-honed knowledge stored in our heads about a how a dialect works is not our exclusive musing, meant only to be pulled out in an armchair on a snowy evening. The loss of an analysis due to a fried hard-drive in which years of personal labor have been invested is not merely my own private agony. The choice to shelve irreplaceable data because of a miserly notion that I must hammer out every single detail in personal perfection is not mine to make. It’s not my language. It’s not my data. It’s theirs. It’s the world’s. After all, in the beginning was the Word. In the beginning there was language—a medium for communication. A medium for building relationships. Linguistics is about people, not data. Communities, not vowel clusters. Tainae. Gabri. Awara. My notebooks are stuffed full of language names that hold only cursory meaning for me, but are the crux of identity for a small group of people in the Amazon rainforest or Chaddian desert. That complex verb conjugation I barely understand? It’s spoken effortlessly from an Asian cradle and wielded as a powerful tool in order to love, hurt, do business, and praise the Lord. These are no mere symbols on a page. In the beginning, God could have named Himself as anything. But He chose the Word. And that, if anything, ought to make me want to back up these words on a few more flash-drives.